New Delhi, January 23 (PTI): Indian citizenship would not be granted to any foreigner without the consent of state governments concerned after the passage of the Citizenship (Amendment) Bill, the Home Ministry said on Tuesday. 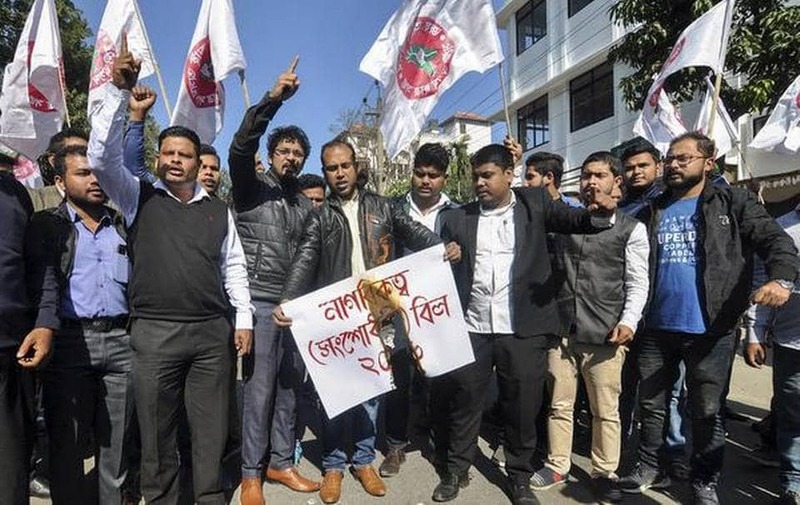 A large section of people and organisztions in the Northeast have opposed the Bill saying it will nullify the provisions of theAssamAccord of 1985, which fixed March 24, 1971 as the cut-off date for deportation of all illegal immigrants irrespective of religion. There have been sporadic protests against the Bill in the region ever since it was introduced and passed in the Lok Sabha on January 8, 2019. Home Minister Rajnath Singh has already said the Bill will apply to all States and Union Territories and the beneficiaries can reside anywhere in the country. Home Ministry sources said the ministry is considering a proposal to provide incentives to those people who want to sertte outside Assm and the North Eastern States. Only a small number Bangladeshi nationals are likely to benefit from the Citizenship Amendment Bill, as fewer than 200 people from the neighboring country have so far availed the Long-Term vVsas (LTVs), a senior Home Ministry official said. The number of LTVs issued by the Union Home Ministry to Bangladeshi nationals from 2011 to January 8, 2019, is just 187, the official told PTI. “There cannot be too many Bangladeshis applying for the Indian nationality under the proposed new law. Otherwise, they would have already taken the LTVs for which criteria are the same,” the official said. Of the 187 LTVs granted to Bangladeshi nationals, only two were given in 2018, three in 2017, 50 LTVs in 2016, 26 in 2015, 74 in 2014, 27 in 2012 and four in 2011. No LTV was issued to any Bangladeshi national in 2013. Arunachal Pradesh Chief Minister Pema Khandu has joined hisAssamcounterpart Sarbananda Sonowal in defending the Citizenship (Amendment) Bill, 2016, and said “people with vested interests” have been misinterpreting it to create confusion. Mr. Khandu heads a Bharatiya Janata Party government in Arunachal Pradesh, while Mr. Sonowal leads a coalition government with the BJP being the major player. “Some people with vested interests are opposing the Bill with misinterpretations creating confusions among the people that it will have a negative impact upon us. This is not true; rather, the Bill will help us in rebuilding a balanced demography of the region,” Mr. Khandu said in Arunachal Pradesh’s East Kameng district on Sunday. “I am sure it (Citizenship Bill) will not harm us as we are safe from any kind of infiltrators due to the Inner Line Permit (ILP) mechanism,” Mr. Khandu said. Anyone entering Arunachal Pradesh from elsewhere in India requires an ILP as mandated by the Bengal Eastern Frontier Regulation Act of 1873. Various organizations, including the All Arunachal Pradesh Students’ Union, have been protesting the Bill. They say it would make thousands of Chakma and Hajong refugees displaced from Bangladesh and Tibetans from China eligible for citizenship in the frontier State.